Over the years, I have experimented with various exercise protocols. 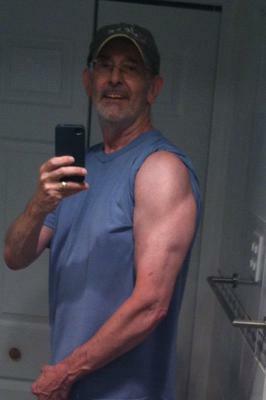 Now that I’m in my mid-sixties, I’ve searched for a system that decreases sarcopenia (age-related muscle loss) and osteoporosis as well as maintaining cardiovascular health. A system that stands out is Metabolic Resistance Training (MRT). I’ve been working with MRT for a few months and want to share with you some of my thoughts and experiences. My goals during this period have been to reduce body fat, increase muscle mass and maintain and deepen overall fitness. MRT is ideally suited for all three goals and good for seniors to entertain. •	It is of short duration. I take between 30 – 40 minutes per workout making it very efficient and time saving. Some routines can be done in 15 minutes. I can get in and out of a session in half the usual time. •	It uses high reps. Normally I work between 15 and 20 reps. Recent research has discovered that lighter weights and higher reps build muscle. Thirty, 40 even 50 reps or more have proven to be beneficial. •	It pushes to failure and all-out effort. MRT demands maximum energy expenditure that mobilizes the metabolism and burns fat. You don’t have to go to failure during each set but the last set needs to be at or close to failure. •	It utilizes very short rest in between exercises. Some experts recommend no rest between sets, others prefer 30 – 60 seconds. Less rest means greater intensity. I do 30 seconds between sets unless I’m really exhausted. •	It doesn’t use light weights. Poundage needs to be in the 60 – 65% of 1RM. You want the weights to demand all-out effort that truly taxes the body. •	It is generally done in circuit, superset, or combo (aerobic and anaerobic) formats. You can use full-body or split routines. I use a split routine to good advantage. •	It normally employs opposing muscle groups. It pairs movements such as push ups and chin ups. •	It can be done using body weight, free weights, machines, resistance bands, etc. •	It tends to use compound movements over isolation movements. Some isolation exercises do have a place, such as curls, triceps extensions, etc. •	It increases EPOC (excess post-workout oxygen consumption). In other words, it burns fat for a long period of time after your workout is completed. What does an MRT Workout look like? MRT routines are generally of a circuit, superset or combo variety. You can do a traditional full body circuit or do super sets that combine opposing muscle groups such as chest and back. The third or combo approach pairs an aerobic exercise with an anaerobic one. The combo could be a few minutes on a exercise bike and then a bench press followed by a few minutes of some form of calisthenics. It is all repeated for two or three cycles. This approach can be grueling but really burns fat. Super sets (all done between 15 and 20 reps with 30 seconds rest between movements and 1 minute rest between super sets). I normally do three sets of each super-set. On alternate days I do a version of the combo approach: five to ten minutes on the stationary bike and then a few sets of a combination of cleans, front squats and presses all in sequence. Sometimes I may do them all separately. I then get back on the bike for five minutes and then back to some form of resistance work, possibly dumbbell curls or pushups, crunches, etc. I do abdominal work during the alternate day workouts. I’ve done MRT routines entirely with resistance bands. The bands are fabulous for quick and relentless workouts. Often I do a mix of free weights and resistance bands for variety. Caution: MRT is not a beginners program. It is intense and requires some level of fitness. I suggest that anyone wishing to try MRT have a few months of training under their belt. Start with a basic resistance program and incorporate some high intensity aspects to it. After a few months you may be ready to go all out with MRT. Consult your health practitioner, if necessary. It is advised by most experts to do MRT for up to six weeks and then return to a less strenuous format. Periodization allows the body to recover from a very intense workout regimen. Personally, I have found MRT to be effective in increasing my aerobic and anaerobic fitness simultaneously with a minimum of the traditional, long slow stuff so popular in the past. MRT is quick, demanding but enables me to maintain body weight, reduce fat and build muscle. As a slow responder to exercise, MRT helps me to get the most out of what I put in. An introduction to MRT can be found in an article by Brad Schoenfeld, an internationally known fitness trainer: http://www.bodybuilding.com/fun/metabolic-resistance-training-build-muscle-torch-fat.html. If you are skeptical about high rep training a good review of the literature can be found at TrainingScience.com: http://trainingscience.net/?page_id=301. For an MRT introduction, Marc Perry of Built Lean has written a good article: http://www.builtlean.com/2011/01/10/metabolic-training-101-definition-benefits-exercises/. In addition, he has an article on the super set approach that I employ: http://www.builtlean.com/2010/04/30/metabolic-workout-that-burns-a-ton-of-calories/. For beginners, take a look at: http://www.trainonline.com/beginner-metabolic-boost-work-out-workout. As a beginner you have to be cautious as to what you can handle. A good intro vid from XFactor using bodyweight : http://www.youtube.com/watch?v=UpvepW_eJ3I. This is a very well written and detailed article. The regimen is very well laid out, and easy to follow. This can also be modified for non-seniors looking to supplement their own workouts. Thanks for the insight! This is a great workout regimen, one that I'm going to share with my own family and friends. The level of detail and research that you put into this definitely shows! I'm glad that you see the program's value and that you're passionate about providing stimulating advice for those that feel they may be "too old". Your findings here can positively impact men and woman both physically and mentally. Thank you for this and I'll look forward to more insightful and productive posts! Your article gave me education and structure on MRT. I have always wanted to try it but was afraid. I will certainly try your advise. You make it sound so easy but I am sure it is tough! Thanks for your help!